This functionality is available to users of Professional and Enterprise subscriptions only. Release management is a set of automated workflows in Onshape used to manage releasing revisions of parts, assemblies, drawings and imported files (translated or not) in a document. This functionality is available only for the Onshape Professional and Enterprise subscriptions and allows you to establish workflows and tools for your entire company. Onshape Release management is non-blocking and is built directly into Onshape's design and version control system, requiring no additional products, installs or extensive IT management. All users in your company are automatically provisioned with the latest workflow settings and updating is automatic for all users, so there is never a situation where someone is accessing an out-of-date platform. A typical workflow starts by identifying objects to release, including parts, assemblies, drawings and other imported file data, and listing them in a Release candidate. The Release candidate may then be submitted for approval or released immediately by its creator, depending upon the workflow rules defined by the administrator. Administrators have access to company- or enterprise-wide settings to define approval requirements for each release, and to set specific conditions for determining a valid release. In addition to users who need to approve a release, observers may also be assigned to a given release, giving them permission to view the Release candidate without the ability or responsibility to approve it or reject it. Settings like these may be defined according to the company's needs. Users always have access to their designs and are never locked out of editing parts while waiting for a Release candidate to be approved. The team is able to continue to design in parallel, and does not have to wait for the approver to review the design. There is never a question of "Do I have the latest changes?" Users receive notifications when a new revision of a released object is approved. Users are not notified when new versions of released objects are created, thereby preventing false notifications of updates. Released objects are able to be quickly identified and accessed with native search capabilities on the Documents page, and linked into other documents for use in assemblies, drawings, and Part Studios. Version - A progress marker in the history of a document. Versions are immutable and capture the complete scope of a workspace at a particular point in time for future reuse or to revert a set of changes. Workspace - An active modeling/design space within a document. Active branch - The branch of the document in which the currently open version or workspace is located. History entry - A record of a change made to a document workspace at a particular point in time. You can compare history entries and restore the document to a particular history entry (point in time) through the context menu in the Versions and history flyout. In progress - The default release state for unreleased workspaces and versions. Objects in progress are either fully editable (in workspaces) or have editable metadata (in versions). Pending - The state of a Release candidate (and its revisionable objects) while awaiting approval by one or more approvers. Rejected - The state of a Release candidate (and its revisionable objects) that one or more approvers chose to reject. Released - The state of a Release candidate (and its revisionable objects) that was either successfully approved by one or more approvers or was immediately released by its creator. Observer - Any member of a company who needs to be informed of the status of a release, but whose approval is not required in the release workflow. Any number of observers (or none) can be included on a Release candidate. An observer must have view permission on the document in order to observe the Release candidate. Approver - A company member whose approval is required in the release workflow. An approver has the ability to Approve or Reject a Release candidate. An approver must have permission to edit the document in order to approve or reject a Release candidate. Revisionable object - Any part, Assembly, Drawing, and any file in an Onshape document can be revisioned and released in Onshape. Release candidate - A user-selected group of revisionable objects that moves through the release workflow together. A Release candidate may contain a single part or an entire product including parts, Assemblies, Drawings, and other files. Not revision-managed objects - Objects that may need to be included in a Release for reference purposes but whose revisions do not need to be tracked. 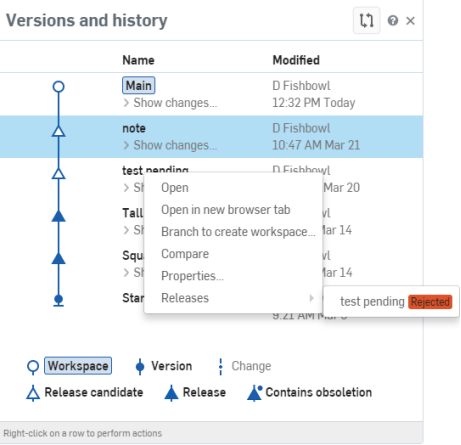 Onshape Release management is integrated directly into Onshape's underlying version control system. As shown in the diagram below, the Release workflow starts in a workspace where all parts, Assemblies, Drawings and other revisionable objects are editable and have, by default, an In progress state. During the design process, you may create any number of versions to mark your progress. Each revisionable object in an Onshape version created outside of the release process will also remain In progress, as a Release cannot be created directly from a version. Creating a Release from an in-progress workspace prompts you to fill out a Release candidate. Once completed, you either submit the Release candidate for approval or release it immediately, depending on the company's defined workflow settings. When a Release candidate is submitted for approval, a version is created, the version is automatically named for the Release and marked with an open triangle icon in the Version and history graph. The state of the revisionable objects within the Release candidate is also set in the version, to Pending. When a Release candidate is approved (released), the version is marked with a solid triangle, , and the state of the revisionable objects within the Release candidate in the version are set to Released. Similarly, if one or more approvers rejects the Release candidate, the version is marked with an open triangle, , and the revisionable objects within the Release candidate reflect a state of Rejected. If one or more objects in the Release are obsoleted, the version is marked with a solid triangle with a dot, , and the obsoleted objects within the Release reflect a state of Obsolete. It is critical to note that state changes (eg. from Pending to Released or Rejected) take place on a single version. That version contains the immutable source of truth for the released revision of each object in the Release. During this process, the team can continue to edit any workspaces in the document, create versions or even create additional releases. None of the workflow actions described above ever block progress.